Paleontologists have discovered the oldest mammalian tooth marks yet on the bones of ancient animals, including several large dinosaurs. They report their findings in a paper published online June 16 in the journal Paleontology. Nicholas Longrich of Yale University and Michael J. Ryan of the Cleveland Museum of Natural History came across several of the bones while studying the collections of the University of Alberta Laboratory for Vertebrate Palaeontology and the Royal Tyrrell Museum of Palaeontology. They also found additional bones displaying tooth marks during fieldwork in Alberta, Canada. The bones are all from the Late Cretaceous epoch and date back about 75 million years. The pair discovered tooth marks on a femur bone from a Champsosaurus, an aquatic reptile that grew up to five feet long; the rib of a dinosaur, most likely a hadrosaurid or ceratopsid; the femur of another large dinosaur that was likely an ornithischian; and a lower jaw bone from a small marsupial. The researchers believe the marks were made by mammals because they were created by opposing pairs of teeth—a trait seen only in mammals from that time. They think they were most likely made by multituberculates, an extinct order of archaic mammals that resemble rodents and had paired upper and lower incisors. Several of the bones display multiple, overlapping bites made along the curve of the bone, revealing a pattern similar to the way people eat corn on the cob. The animals that made the marks were about the size of a squirrel and were most likely gnawing on the bare bones for minerals rather than for meat, said Longrich. "The bones were kind of a nutritional supplement for these animals." 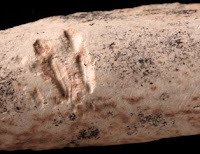 There are likely many other instances of mammalian tooth marks on other bones that have yet to be identified, including older examples, said Longrich. "The marks stood out for me because I remember seeing the gnaw marks on the antlers of a deer my father brought home when I was young," he said. "So when I saw it in the fossils, it was something I paid attention to." But he points out that the Late Cretaceous creatures that chewed on these bones were not nearly as adept at gnawing as today's rodents, which developed that ability long after dinosaurs went extinct.